Here is the tip/ resolution for debugging in VS 2015 when you faced issue with symbols are not loaded. Why symbols are loaded? After analyzing found that trying to debug the code which is out of your customized code which means other suite/ model code (standard Form from other model/ non extension form). 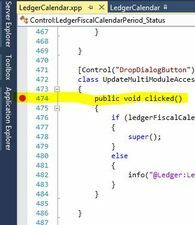 So try to load symbols for the module and start debugging as shown below. 1. Put break point where you required in code. 2. Attach to Process. Debug->Attach to Process. After Attach to process (w3wp.exe) you will face that Symbols are not loaded issue. 3. Go to Module as shown. 5. Now Click on Load all symbols button. Make sure that select properties as shown below. 6. Now system will load all symbols related to Ledger Module for you. Click OK after finish.